This became the title of my Mindful Parenting Book – part handbook, part information guide. Creating lots of Images and affirmations, that I hoped would appeal to as many people as possible. This was then sent to friends to read and edit as much as possible. It became apparent very quickly that trying to publish with a small (or shall we say no budget) was no easy task. I had to decide whether to just shelve the project or go with it. 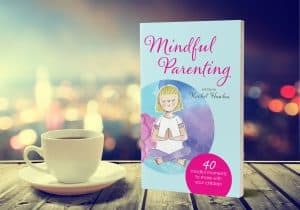 The intent of the book had always been to share the joy of mindfulness with as many parents as possible. So, onwards and upwards. Alongside the book, I also wanted to set up a separate ‘Resources‘ page, that parents could just tap into. Full of free printables, downloads, and tips that would help parents bring in Mindful Moments when they wanted. It would build and develop as time and skill allowed, creating a growing library of resources. My journey into self-publishing was a deep well of learning: how to write something anyone would want to read? How to set this for publishing? How does Amazon self-publishing work? Not to mention how do you then market a book? Ahhh, it took me down several rabbit holes! After several months of work, it seemed like it was all finally coming together. Doing this without much of a budget, and limited time was a challenge I had not expected. Everyone talks about self-publishing as its the easy option, the reality I found to be very different! So, the book is now uploaded onto Amazon and according to all the blogs, articles and advice, the main thing was to aim for an ‘official’ launch day. Sounds great, however being a one-woman marketing team, running two businesses and looking after the kids meant that I had another decision to make. 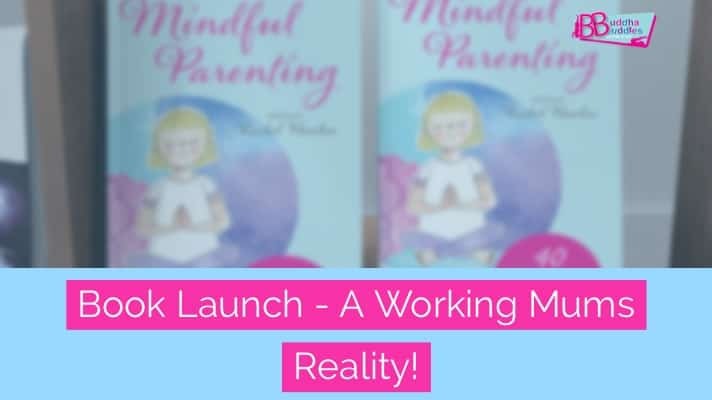 How to juggle work, family and ‘create’ this amazing launch? Honestly, there was just no way of doing that and enjoying the process at the same time. 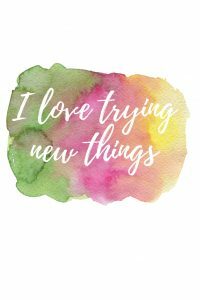 So, I decided to just go for an organic launch, sharing with people I knew and seeing where it would go. I was as ready as I was ever going to be! I checked on Amazon on a Friday morning and my book was now ready to ‘go live’. So a strange mix of joy and terror aside it was time to hit the ‘go live’ button and get the book out there. This (i realised later on), was meant to be one of those real life ‘whoop whoop’ moments! Corks popping, bunting flying celebration moments. Mmmm, maybe not! I got my daughter to hold the phone while I quickly made a 1-minute video to post on Facebook. Posted it straight away, then reality kicked in as I made the packed lunches for school, walked the dog, put the next load of washing into the machine and emptied the dishwasher before heading off to work! No fanfare awaited me at work! The day continued as they normally do, work and a meeting and back home afterward. I did not realise that it had all passed me by until much later in the evening. So, this one I will put down to experience and make sure I have the bubbly chilling beforehand (next time!). Running a business (or 2) and your home and family is never an easy juggle. Often, something has to ‘give’ in order for it all to work. Consuming though this book has been, I did not want it to override everything else. Parents Evening was still in the diary, sleepovers and days out went ahead. It was funny in a way, I had to become more of a ‘Mindful Parent’, to actually enjoy publishing the book! Exciting as this has been, I also see the errors I made and of course, I am already planning the next book. In fact, the next 3 books are somehow coming together! Each one, I am sure I will learn more as I go through the process. The main point for me has been the decision to enjoy the process and not stress out at all the little stuff or even big stuff that could or should, have been done. The role of a working mum is something that I have to work on all the time, how to stay mindful of my children and build my businesses at the same time. Many parents find this a difficult balance to make. You can read some helpful tips on the blog for mums on How To Create More Me Time which gives some little tips on making time for yourself. So for now, do have a look at the book and see what resources you can use in the FREE downloads. 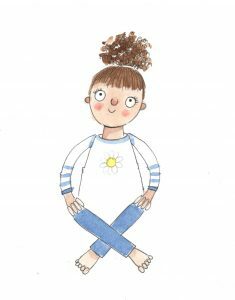 There are also links to lots of useful Mindful Tools that can help you create your own family Mindful Toolbox. I would love to know what you think about it, you can drop me an email or follow me on Instagram @rachelhawkes. There are also lots of great ideas on the Pinterest Boards that go with the book too. If you would like to receive more tips on how to add in some Mindful Moments to your family, then sign up to our newsletter. Every Month there will be some great free stuff coming your way. This will only be accessible for those on the mailing list.